CHICAGO – Great films refuse to go away. Since I saw Henry Selick’s excellent “Coraline” months ago it has lingered in my memory like a dream and watching it again on the recently-released Blu-Ray (“Coraline” is also available on DVD), I’m reminded of how clever, creative, and captivating this piece of film was in theaters and will be every time I watch it with a perfect home release. Nothing gets old about “Coraline”. Actually, it gets richer with each viewing. That’s the mark of a great movie and exactly what most buyers willing to pay the still-too-steep purchase price of most Blu-Ray releases are looking for - something to watch again and again. You’ll watch “Coraline” again and again. Coraline was released on Blu-Ray on July 21st, 2009. The word I think of when I watch “Coraline” is mesmerizing. Based on the beloved book by Neil Gaiman, “Coraline” features excellent voice work by Teri Hatcher, Dakota Fanning, John Hodgman, Ian McShane, Jennifer Saunders, Dawn French, and Keith David. Fanning voices the lead character, a young girl who we meet after having moved to the first floor of a rental home with her writer parents (Teri Hatcher, John Hodgman of They Might Be Giants). Like a lot of children, Coraline is nearly bored to death. She wanders the grounds near the house, befriending odd characters like Wybie (Robert Bailey Jr.), a drunken acrobat named Bobinsky (Ian McShane), and a pair of former stage stars (Jennifer Saunders & Dawn French) who live downstairs. But she finds true adventure through a secret door in her own house. Like Dorothy in “The Wizard of Oz” or Alice in “Alice in Wonderland,” Coraline finds an alternate universe that seens magical and inviting at first but quickly grows darker. Through the door, Coraline finds a world with another mother and father and far more entertaining versions of her housemates. Of course, as with all fables, everything is not what it seems and Coraline will have to fight her way back to the real world if she wants to survive. 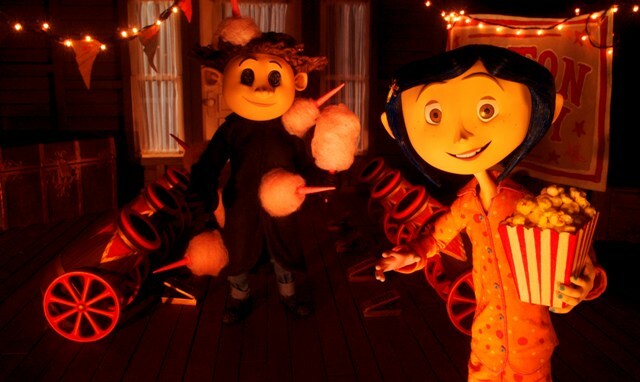 One of many things that the creative team behind “Coraline” gets so right is that it’s okay to scare a kid. Some of the best children’s fiction - certainly the most timeless children’s fiction - has an element of honest, genuine fear. That’s something that modern family filmmakers too often forget. It’s good for kids to feel a shiver down their spine. Don’t be surprised if you adults feel one too. The fearless design of “Coraline” sets the film apart from the very beginning. From the amazing character design to the gorgeous backdrops, “Coraline” looks incredible. It is such a visual accomplishment that you will almost forget that it’s all stop-motion animation. Great voice work by Fanning goes a long way to help the believability of the entire piece. Sadly, “Coraline” looks better in 3D in theaters than modern technology could allow it to look on Blu-Ray. The old-fashioned glasses and the way Blu-Ray presents 3D has yet to be perfected. “Coraline” in 3D on Blu-Ray looks cool but the 2D version is so crystal clear and less headache-inducing that I have to recommend it instead. 1080P is practically 3D on its own and there are no annoying glasses to deal with. Luckily, you won’t have to choose when you’re at the store. You can do so at home. 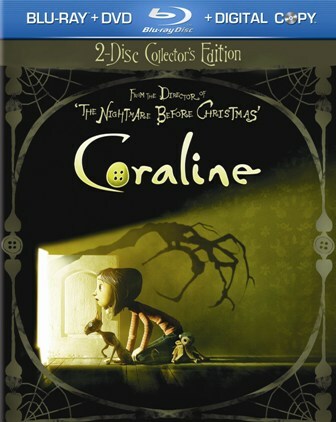 The two-disc collector’s edition of “Coraline” includes a 2D version and 3D version and includes the film on Blu-Ray, DVD, and digital copy. It’s a complete presentation of the film, allowing fans to watch it wherever, wherever, and however they choose. The stunning picture, perfect audio, and variety of ways to watch the film would make “Coraline” a remarkable release but the special features push it over the edge and into “one of the best of the year” material. Universal’s amazing U-Control functionality allows for an immersive how-to experience with animatics, interviews, voice sessions, and behind-the-scenes footage playing picture-in-picture while you watch the film. ALL Blu-Rays should be this expertly laid out. Other amazing features include deleted scenes, “The Making of Coraline,” “Voicing the Characters,” “Creepy Coraline,” and a full-length commentary by Henry Selick. 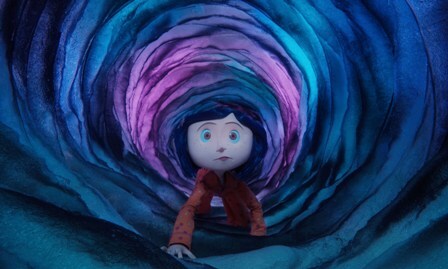 It only came out a few months ago, but “Coraline” gets better every time I see it and even gets stronger in memory. It’s a cinematic dream that is proving harder to shake than any of us first thought and with an amazing Blu-Ray release like this one it’s timelessness seems apparent already. ‘Coraline’ is released by Universal Home Video and features voice work by Dakota Fanning, Teri Hatcher, Jennifer Saunders, John Hodgman, Robert Bailey Jr., Dawn French, and Ian McShane. It was written and directed by Henry Selick. The Blu-Ray and DVD were released on July 21st, 2009. It is rated PG.